It's been a hugely busy week and I'm pretty exhausted. Somehow my weekend routine helps at these times as it gets my body clock back in order. I'm in the cafe having just gone through my Spanish and Chinese practice and I'm about to dive back into the book I've been studying for the last couple of weeks on mirror symmetry, which I'd like to speak about at some point soon. It's an excellent book, both for your mind and your body, weighing, as it does, about the same as small child. I've also had a former collaborator out here for the week which has been enjoyable. He gave a talk on his current work on ABJM and we've chatted through a few ideas for future collaborations, though we admit that we're both too busy with current projects to start anything new - I count this as a good state to be in. On top of this I've had a couple of great couchsurfers - a brother and sister from Israel who were extremely friendly and talkative but understanding when I had to sit down and get on with work. 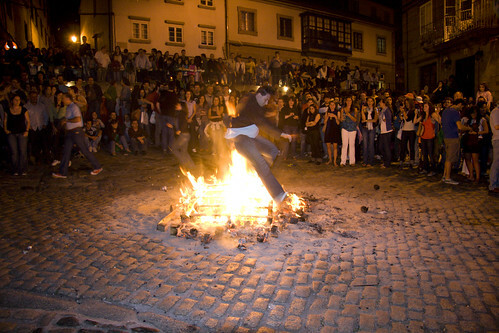 One night this week though I headed out to see one of Spain's most famous festivals, La Noche de San Juan. 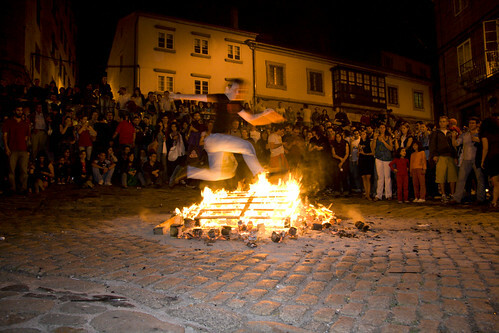 In Galicia on this night, celebrating the summer solstice, fires are lit around the city, Sardines are barbecued, and people come out to party. 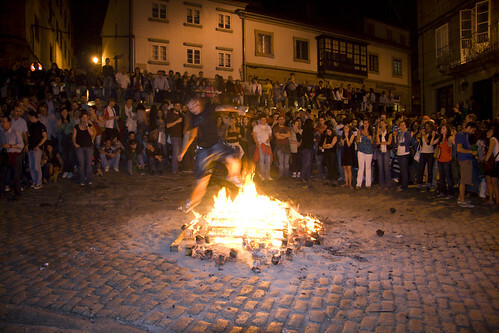 The big event of the night however is when the partygoers jump over the fires, three times (or more depending on who you speak to) to ward off the evil spirits for the next year. The lighting of fires really does seem to bring people back to a very primeval state and something is triggered in the brains of those around which can be seen in the eyes of the jumpers. Not being superstitious, but certainly not wanting to miss out on the fun I got my three jumps in, and the buzz of jumping over a large fire in front of a big crowd was certainly worth the risk of a roasting. There seemed to be few casualties other than a couple of twisted ankles from landing on bits of wood, and the evening was generally a lot of fun. ...now back to the book!